"Chapter 55" / "Chapter 54"
The current season of Veep has been able to mine comedy gold out of the post-White House life of a president who left a very small footprint on American history. 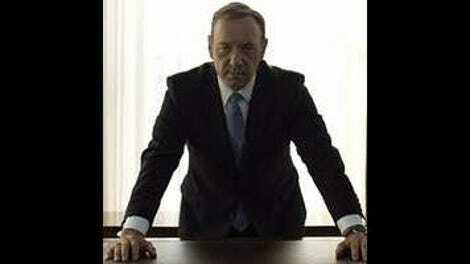 Could House Of Cards possibly be on the same path? After all, we’ve already seen a peaceful transfer of power at the helm of the show, with Beau Willimon stepping down at the end of last season and Melissa James Gibson and Frank Pugliese taking the reins this year. What better time to reboot the premise? Despite how badly the election appears to be going for the Underwoods by the end of these two episodes, however, there’s not much chance of that happening. Frank and Claire Underwood are all about holding onto power, and they’re not going to let a little thing like election results stand in their way. “Chapter 54” finds Frank unleashing his full arsenal of dirty tricks in order to swing the vote his way. He calls an emergency meeting of governors on the pretext of dealing with the terrorist threat, but his real purpose is to put the squeeze on the leaders of five swing states to consolidate polling sites to safe areas protected by the National Guard. (We know this is Frank’s aim because he breaks out of the scene to explain it to us “in case you have no idea what’s going on.” Not that these asides to the camera were ever subtle, but this is a new low when it comes to the writers throwing up their hands and saying “we have no idea how to dramatize this exposition properly.”) Naturally, these consolidated voting stations will be in Democratic strongholds, while Republican areas will see their local polling places taken away. This is a pretty brazen reversal of the way voter suppression usually plays out in America, but this show has always been catnip for the “both sides do it” crowd. The only prevailing ideology is pure cynicism. That being the case, what better way to bolster the president’s case than a false flag operation straight out of Alex Jones’ wet dreams? It’s a genuine act of terror—a cyber-attack that crashes all communications in the Washington DC area—but the perpetrators are not ICO, but the Underwoods and their inner circle. Already this season looks poised to bring all our darkest conspiracy theories to life, but will all this skulduggery be enough to guarantee reelection? “Chapter 54” is such a choppy episode, it’s hard to get a grasp on all the dynamics at play, but things come into clearer focus in the following hour. “Chapter 55” finds Will Conway conducting a 24-hour election eve video chat on Pollyhop (I will never pass up an opportunity to mention Pollyhop); you know, like presidential candidates do. It’s a high-wire stunt given the risks that come with a candidate answering unscreened calls, particularly in the wee hours of the morning on no sleep. Since a Super PAC (completely unaffiliated with the campaign, of course) has put out an ad praising Conway’s wartime heroism, many of the calls are pushing Conway into discussing a matter he’s not comfortable talking about. Team Underwood knows why he doesn’t want to talk about it: his hero narrative is exaggerated at best. They arrange to have Captain Squire, the man Conway allegedly rescued, call in to press him on the details of that day. Squire never goes quite as far as the Underwoods, hoping for a November surprise, would like, so Frank makes a last-ditch effort at derailing Conway’s momentum by calling in himself and pushing the “soft on terror” narrative. When Election Day arrives, the Underwoods partake in an old ritual to pass the time: watching Double Indemnity in the White House screening room. The movie has sentimental value to them, and it’s a rare treat to see them running the lines together. For a brief moment, they’re not plotting and scheming, but simply enjoying a moment that suggests some remnant of shared humanity. Except…look at the movie they’ve chosen and the scene they act out together. It’s all about a couple plotting and scheming together for their own illicit gain. Later in the picture, it turns out that the woman has set up the man as a patsy, and it would be interesting to see if Frank is as enthusiastic about reenacting those scenes. It’s not clear whether Frank and Claire finish watching the movie, however, as the early returns start to come in and they are very bad indeed. “This is our house,” Frank says ominously, “we are not leaving.” If this is going where I think it’s going…well, let’s just say that in the current political climate, I’m not sure how entertaining it’s going to be to watch the American presidency transformed into a dictatorship. 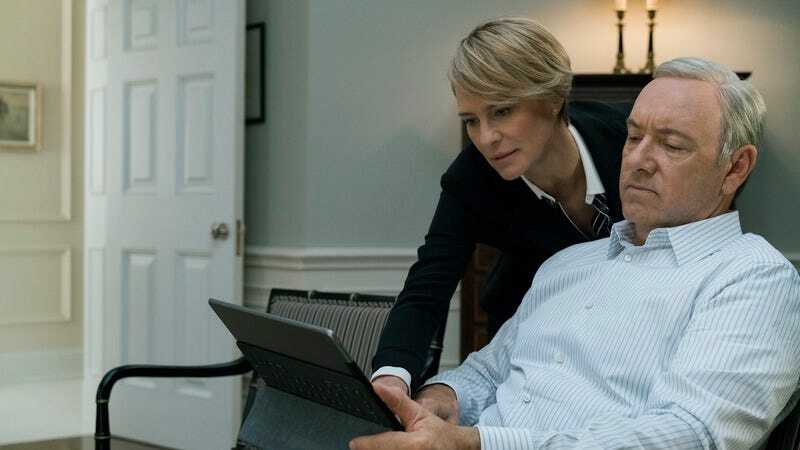 I’m no political consultant, but I can’t see the morphed faces of Frank and Claire Underwood having any effect on voters beyond making them mildly queasy. Claire runs into Ken, an old friend of Frank’s at an appearance (or rather, he makes a point of running into her), and he informs her that another close friend of Frank’s from The Sentinel, Tim Corbet, has gone missing on the Arkansas River. Ken strongly implies what we already know from the show’s early seasons: that Frank and Tim were lovers, and it wasn’t just a casual fling. Claire’s reaction is typically inscrutable. She’s definitely disturbed by the encounter, but it’s not clear which bothers her more: that Frank may have loved someone else or that Ken has a big mouth. Given the fluid nature of the Underwood marriage, the latter may be more likely. On election eve, we see Frank in a chair at Claire’s bedside as they discuss whether they’ve done enough to ensure victory. Only late in the scene do we get a wide shot revealing that Tom Yates has been asleep beside her all this time. “It was the walk of a dead man,” says Fred MacMurray as Frank gets the news that turnout is down 30 percent in his strongholds. Subtle by House Of Cards standards!